With one hand balanced on the steering wheel, our driver, Thura Thein, fumbled in his pocket as he drove along the busy Yangon road from the airport. A moment later, he pulled out a photograph. Smiling broadly, he thrust it toward us. “This is me with Aung San Suu Kyi,” he proudly declared, and he pointed out the home where the revered Burmese opposition leader spent 15 years under house arrest. It was the same everywhere. People smiled when talking about Burma (or Myanmar, as the military regime named it). Street vendors sold t-shirts displaying Suu Kyi’s face. An office in Bagan hung signs proclaiming “National League for Democracy “. Things are shifting – and the people we met were happy to share their joy. It hasn’t been like this for long. The Lonely Planet guide of 2011 cautions travelers “Don’t raise political questions and issues in inappropriate situations” and “Show equal caution regarding what you ask or say on the phone or via email” as well as “Asking a taxi driver to take you past Aung San Suu Khyi’s house or to an NLD office could implicated them”. To illustrate, our taxi driver in Bagan shared a story about a horse cart driver’s misfortune after he spoke to a British journalist several years ago. The reporter, unbeknownst to the driver, was secretly taping his criticisms of their forced move from old Bagan to new Bagan and published the comments in a western newspaper. As a result, authorities confiscated the driver’s license, leaving him unable to support his family and dying a couple of years later “because his heart was heavy”. While people may be rejoicing today, the tourist industry is holding its collective breath in anticipation of an overwhelming influx of people into the country. Yangon currently has only 8,152 hotel and guesthouse rooms, with a third of them being of international standards, and it is estimated that the country will have to handle around 700,000 visitors each year who pour in to see the sights. For travelers, the consequence is higher room rates and less choice for accommodation. 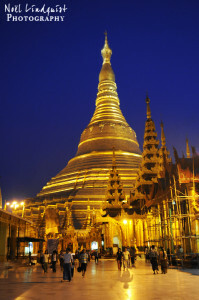 The New York Times recently ranked Burma third on its list of the top 45 destinations of 2012. Go now, before the country becomes inundated with tourists. For a whistle-stop tour of Burma, the highlights include visits to Bagan and Lake Inle. We had less than a week in the country and decided on the following itinerary: One day in Yangon, two nights in Bagan, two nights in Lake Inle and our last night in Yangon (with flights between cities since buses were too time consuming). 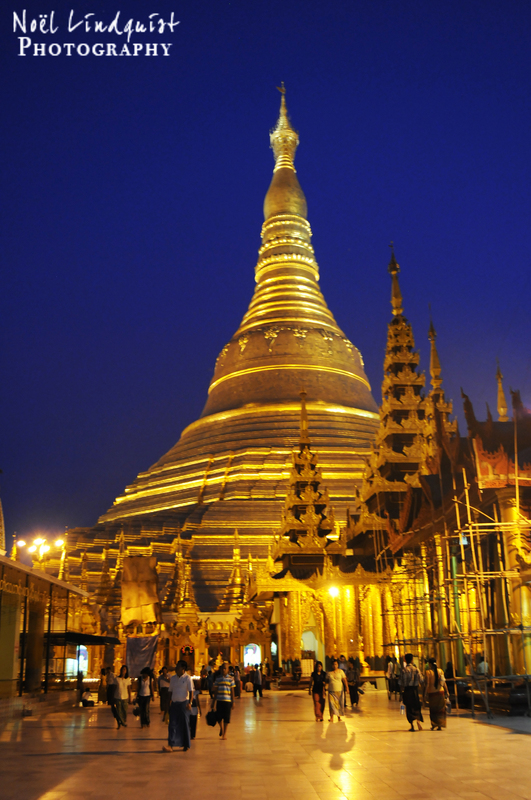 If you have limited time in Yangon, the Schwedagon Pagoda is one of those places you simply can’t miss. We were expecting an attractive temple but had no idea we’d see such sheer, jaw- dropping magnificence. The enormous, glittering Buddhist monument dwarfs every other temple we’ve seen throughout Asia in both size and splendor; made even better by a night-time visit, when twinkling lights illuminate the jeweled shrines and subdued chanting echoes between the golden pillars. It’s open every day from 4am to 10pm and you need to dress respectably to visit. We didn’t see much of the city other than traffic and beaten-up taxi cabs but it’s a place where lots of “first ever” events are happening: In December, there was the “first ever countdown” on New Year’s Eve, the “first international artist (Jason Mraz) ever to perform at a open-air, public concert” took place on December 16 and the “very first Yangon International Marathon” took place last month. While you’ll get a better feel of the country traveling by road, flights throughout Burma are reasonably priced and, in our experience, extremely efficient (sometimes boarding 10 minutes before take-off and leaving precisely on time). We flew between cities on Air Mandalay and Asian Wings and each flight cost between $38 and $55 per person. There’s much written about travel in Burma with the greatest emphasis on taking perfect currency – and it’s a warning to be heeded. We exchanged dollar bills at a bank before leaving home and scrutinized every one of them to make sure there were no marks, folds or tears since they’d be rejected. Along the way, we met an American couple whose imperfect $100 bills had been refused and they were unable to go anywhere or do anything as they had no cash, and no credit cards were accepted. Since then, ATM withdrawals have been introduced, but transactions don’t always happen. Once leaving Yangon, the most visited spots are Mandalay, Bagan and Lake Inle. We didn’t have time for Mandalay but spent a couple of days in the other two, which we found very well worth seeing. Bagan, known as the city of thousands of pagodas (4,400 is the number listed), is both beautiful and fascinating. We’d planned to rent bikes but it was too hot so we hopped onto a horse drawn cart and let our driver, Minthu, show us the sights. Exploring the area by horse cart is the best way to go as it fits the leisurely meandering pace of the city. There’s no way you can see all the temples (or would want to) but local drivers know their way around as well as being familiar with the stories and local spots so you’ll get a good taste of the area. It costs around $20 for a full day and you can find a cart when you get into town, or search online to find the few enterprising drivers who have email addresses. Other than meandering around the temples, cycling the dirt roads and exploring the nearby market (in Nyaung U), there’s not a lot to do in Bagan. You can take a sunset boat ride on the Ayeyarwady River, visit workshops making lacquer ware and sample local cuisine in local restaurants or you can just soak up the atmosphere and be. Lake Inle, in contrast, offers plenty to do and is inspiring with its multiple activities and beauty. The huge freshwater lake measures 116 square km and is located at an altitude of 880meters, so temperatures are cooler and you may need long sleeves and a blanket at night. The people of Lake Inle live in cities bordering the lake, in numerous small villages along the lake’s shores and on the lake itself so it’s the focal point for everything in the region. Cheaper accommodation can be found at Nyaungshwe on the north shore but it’s worth splurging to stay in a hotel right on the lake for the full effect. 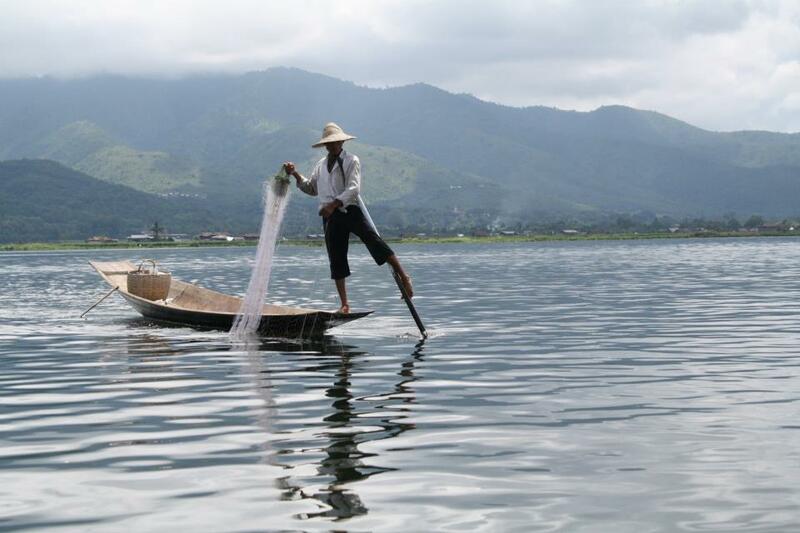 Since the focal point for the region of Lake Inle is the lake itself, the best way to get a taste of the area is on the water. Rent a boat for the day and poke around the floating communities where you’ll visit a wonderful market at the foot of a pagoda selling handmade crafts as well as neighborhood s where artisans practice their trades. There’s the blacksmith shop, the silk and lotus weaving centre, silver-making workshops and cheroot shops where young women hand roll thanal-phet tree leaves and fill them with tobacco seasoned with honey, tamarind, anise and a variety of herbs. We were disappointed to discover the much-publicized pagoda with the jumping cats no longer had cats that jump, but we did discover the Inthar Heritage House, a beautiful old traditional house on the river devoted to the preservation of Burmese cats. It’s not one of the customary destinations so you’ll have to ask your boat driver to make the stop and we found it was one of our favorite attractions. Not only was it fascinating to see the house, but we spent time with dozens of beautiful cats that are housed in large enclosures where they roam free, rub up against you and, in our case, draped themselves around our necks and climbed into our backpacks. 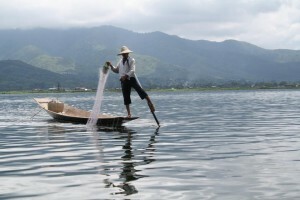 Another fascination sight in Lake Inle is the local fishermen who you’ll see dotted around the lake. They are known for practicing a distinctive rowing style which involves standing at the stern on one leg and wrapping the other leg around the oar. This unique style evolved because the lake is covered by reeds and floating plants which makes it difficult to see above them while sitting, and standing provides the rower with a view beyond the reeds. When travelling to Lake Inle, keep in mind that the airport is located 35 km away in Heho so it’s about an hour’s drive to (or from) your destination. At first, we thought we’d flown into the wrong place so we followed the crowd and discovered there are taxis which charge between $25 and $40 (or you can share it with others and split the fare). If you book in advance with your guesthouse, the taxi fare will be much less. The boat transfer to your hotel (if you’re on the lake) is $10. Below are some of the favorite places we experienced during our travels. Kumudara Hotel – Charming, peaceful hotel on the outskirts of town, located on four acres of garden with an infinity pool and views across hundreds of pagodas. Sarabha 3 restaurant, near the Sarabha Gate – Local Burmese food in a very casual outdoor setting near the temples with cheap, delicious dishes. Be Kind to Animals restaurant – Delightful vegetarian restaurant in Old Bagan with a wonderful selection of delicious dishes in a garden setting. Golden Island Cottages – Beautiful, individual bungalows situated on the water with sweeping views of sunset and sunrise over the lake.